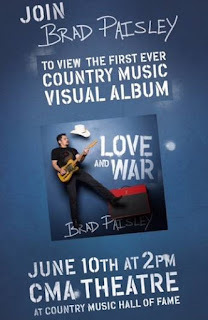 Enter to Win Tickets to Exclusive Brad Paisley Event at the Country Music Hall of Fame! 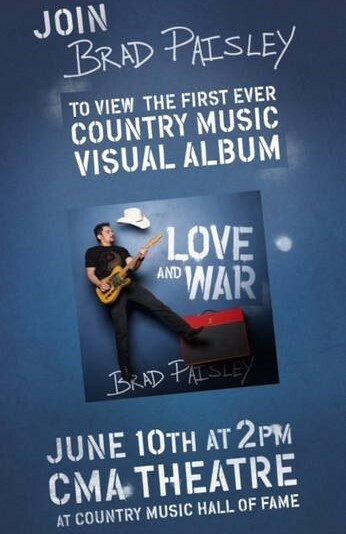 Enter to win a pair of tickets to a special fan viewing of the first ever country music visual album, Love and War, on Saturday June 10th at 2:00PM at the CMA Theatre at the Country Music Hall of Fame. Winners will be chosen randomly from all entries. If you are selected you will be notified via email. Tickets are not guaranteed. Enter to win here! Tickets: Enter to win here.